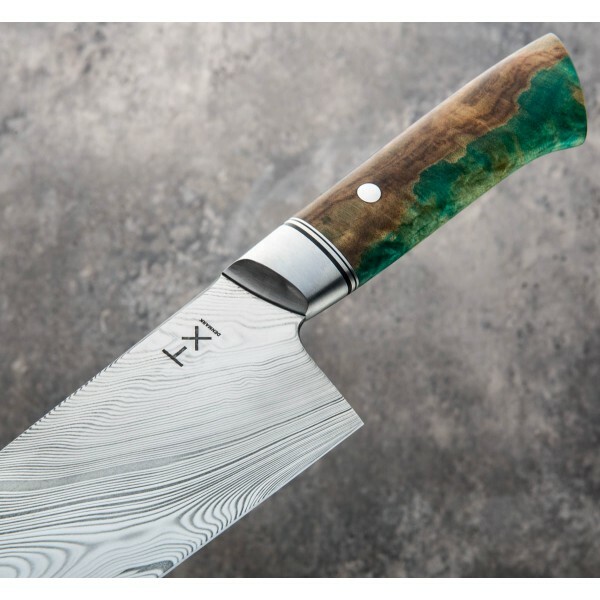 Our first knife from Steffen Toksvig of TX Knives out of Copenhagen, Denmark, and certainly not our last, is this superb 240mm / 9.45" full-size chef knife in Sparse Twist Damasteel stainless damascus. 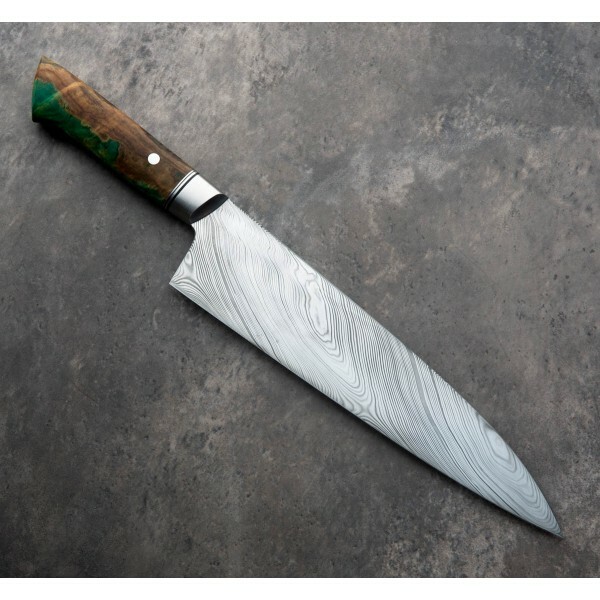 Steffen's interpretation of an Eastern style gyuto profile with Western convex geometry and a full distal taper combine beautifully with the Western style bolstered handle in dyed, stabilized maple featuring a 304 stainless steel bolster accented by G10 and steel spacers. 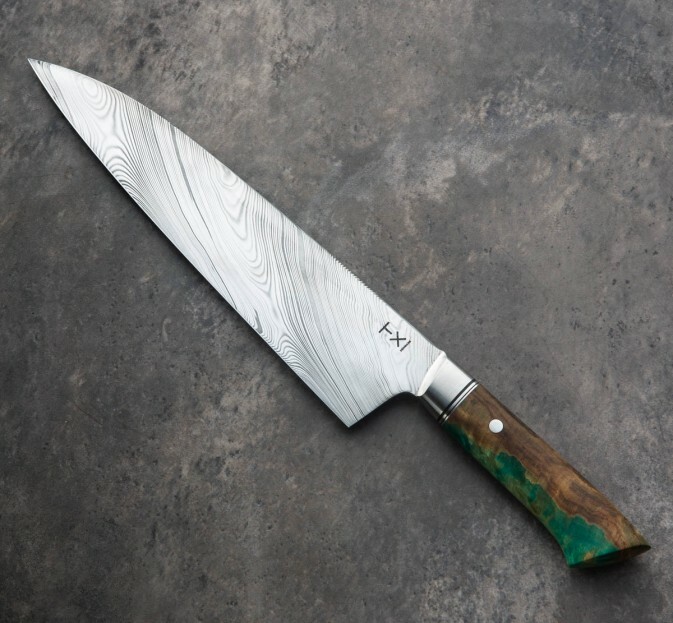 Steffen wholly produces each knife, heat treating in-house using a PID controlled furnace and tempered in a PID controlled oven to achieve a hardness of 62-63 HRC in this Damasteel blade. Blade length: 240mm / 9.45".  Overall length: 365mm / 14.4". Blade width above heel: 2.3mm. Blade width 1" from tip: 1.9mm. Blade height at heel: 54mm. Weight: 7.5oz / 213g. Blade: Sparse Twist Damasteel stainless damascus. Handle: Stabilized colored maple with 304 stainless steel bolsters, G10 and stainless steel spacers, 304 stainless handle pin.